Liverpool’s oldest regular starter James Milner has waxed lyrical about the heart his team-mates showed in the Merseyside Derby win over Everton. With 95minutes on the clock, Sadio Mane tapped in from close-range and won us a crucial three points away at Goodison, which keeps us in touch with leaders Chelsea. 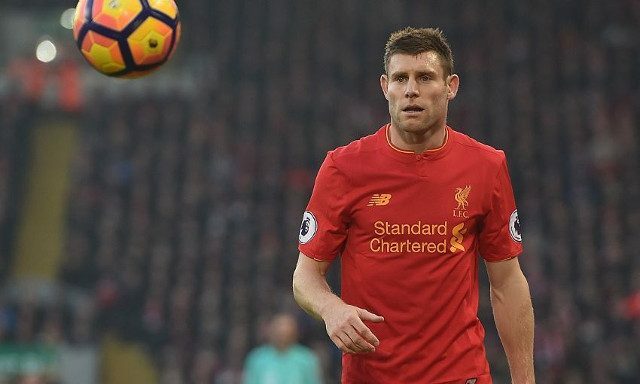 Milner was yet again outstanding at left-back, a position he’d never played until this season when Jurgen Klopp told him he’d be replacing Alberto Moreno’s as the team’s first-choice here. It suits him perfectly, as it maximises his mix of defensive and offensive skills, as well as his ridiculous work-rate, which enables him to patrol the entirety of the left flank. Milner believes that he, along with Liverpool’s other senior players, truly believe something special can be achieved this term. “The belief’s there. I’ve said it since I’ve been here – I don’t think it has been in people realising in the squad how good we are and can be, so I think that’s coming more and more this season,” the Reds’ vice-captain told Liverpoolfc.com. “It was a different type of game, a game which was never going to be a very pretty game – they are very different to all the other games in the season. “To be able to come out of it with a victory and also the way we kept going in the second half, [we] kept playing, kept trying to do the right things, we were on the front foot for the majority of the second half definitely – I can’t remember them being in our box too many times – and we played the game in their half really. Liverpool have made somewhat of a habit of crucial late goals under Klopp. The Borussia Dortmund one sticks out, but there’s been game-changing goals against Norwich, West Brom and Chelsea to boot. It’s indicative of the spirit the manger has instilled into the club.